What is a Residential Recirculating Pump? Circulating pumps are often used to circulate domestic hot water so that a faucet will provide hot water instantly upon demand, or (more conserving of energy) a short time after a user's request for hot water. In regions where water conservation issues are rising in importance with rapidly expanding and urbanizing populations local water authorities offer rebates to homeowners and builders that install a circulator pump to save water. Why would you install a Recirculating Pump? How much will you save? In typical one-way plumbing without a circulation pump, water is simply piped from the water heater through the pipes to the tap. Once the tap is shut off, the water remaining in the pipes cools producing the familiar wait for hot water the next time the tap is opened. By adding a circulator pump and constantly circulating a small amount of hot water through the pipes from the heater to the farthest fixture and back to the heater, the water in the pipes is always hot, and no water is wasted during the wait. The tradeoff is the energy wasted in operating the pump and the additional demand on the water heater to make up for the heat lost from the constantly hot pipes. Are There Different Types of Recirculating Pumps? While the majority of these pumps mount nearest to the hot water heater and have no adjustable temperature capabilities, a significant reduction in energy can be achieved by utilizing a temperature adjustable thermostatically controlled circulation pump mounted at the last fixture on the loop. Thermostatically controlled circulation pumps allow owners to choose the desired temperature of hot water to be maintained within the hot water pipes since most homes do not require 120 °F (49 °C) degree water instantly out of their taps. Thermostatically controlled circulation pumps cycle on and off to maintain a user's chosen temperature and consume less energy than a continuously operating pump. By installing a thermostatically controlled pump just after the farthest fixture on the loop, cyclic pumping maintains ready hot water up to the last fixture on the loop instead of wasting energy heating the piping from the last fixture to the water heater. Often installing a circulation pump at the farthest fixture on hot water circulation loop due to limited available space, cosmetics, noise restrictions or lack of available power. Recent advancements in hot water circulation technology allow for benefiting from temperature controlled pumping without having to install the pump at the last fixture on the hot water loop. These advanced hot water circulation systems utilize a water contacting temperature probe strategically installed at the last fixture on the loop to minimize the energy wasted heating lengthy return pipes. Thermal insulation applied to the pipes helps mitigate this second loss and minimize the amount of water that must be pumped to keep hot water constantly available. 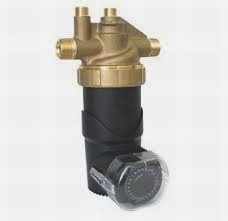 Below is a video on installing a Laing pump. It is pretty easy if you are handy although you will require a 120v AC plug near the pump to power it. If electricity scares you a bit you would want to call the plumber or electrician to put a plug in for you. A professional depending on region would probably charge up to $200 for the install. Which is the Best Manufacturer to go with on these pumps? There are a few major manufacturers of residential plumbing recirculating pumps-they are all good companies and make good product-the choice is often based on your own personal affinity for a given brand or what your installer chooses. Laing Pump Thermotech division of Xylem Water is the manufacturer we generally offer at Conservastore. Laing now also offers a pump that is installed at the water heater but communicates with the farthest faucet in the home wirelessly. No recirculation line is required and no power source under the farthest sink is needed. Suggested savings is 12k gallons of water per year. Hey, I am so glad to know about this Residential Recirculating Pump! It is great equipment. I want to buy honda water pump and I wonder if Honda also provides these kinds of pumps!